For more than 30 years, The Bible Promise Book® has blessed millions of readers. 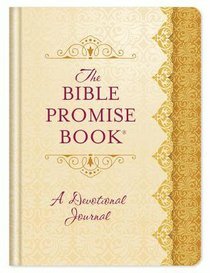 Now this daily devotional journal highlights more than 40 Bible Promise Book® topics from A to Z-from Adversity and Gratitude to Forgiveness, Patience, Salvation, and Wisdom. Great for daily quiet time or Bible study, The Bible Promise Book® Devotional Journal is perfect for readers of all ages. About "Bible Promise Book Devotional Journal, The: 365 Days of Scriptural Encouragement (365 Daily Devotions Series)"
This one year daily devotional will encourage women of all ages to carve out some time in the day to reflect on the God who loves them beyond measure. These devotions are a great way for women to find refreshment and renewal amid the demands of life.